Once again Weir creates a sci fi world built on solid scientific facts. Even better, his foul-mouthed, brainy, and fiercely independent protagonist is a woman — a rare occurrence in this genre. But be aware, there’s a lot of science in this book — mainly chemical and engineering. You might actually learn some things as well as be entertained. This wild action ride of a novel takes place in and around Artemis, a moon colony some 100 years in the future. 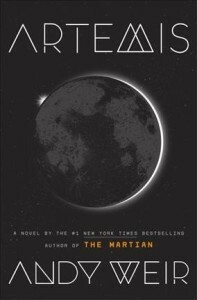 Like in his debut novel The Martian, this near-future setting make it more relatable to the present day; plus it gives Weir a chance to again demonstrate how scientists and engineers would/could/can creatively solve the problems of living on another, deadly world. That’s where the similarity ends, however. Jazz, his plucky and slightly criminal heroine, is always out to make a quick buck. Then she gets a chance to make a million of them. That turns this book into a cliff-hanging crime caper where the challenges and risks she faces far outweigh those of any bank or casino heist ever imagined. This also means a fair amount of information about things like welding in a vacuum, the dangers of mixing various gases, pressure issues, and the like. I admit to glazing over a time or two but it was worth shouldering through to learn what happened next. And, that was what was really exciting about this book. The Martian was pretty straight forward — a guy trying not to die. This time Weir concocted a plot with many twists and turns that had as much to do with human nature — greed, loyalty, ambition, love — as with solutions to deadly situations. Not to mention Jazz is one heck of a character. Rebelling against constant admonitions to utilize her substantial potential, Jazz labors as a delivery person with a not-too-profitable smuggling business on the side. That could all change when a richer-than-Midas Artemis resident offers her a million to destroy the operating capacity of a lunar plant that produces aluminum — and the colony’s air supply. Don’t worry, he doesn’t want anyone to suffocate. It’s business. 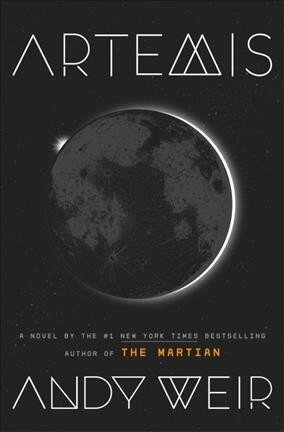 For more about Andy Weir and his books, click here. This entry was posted on Saturday, March 3rd, 2018 at 3:52 pm	and is filed under Book Reviews. You can follow any responses to this entry through the RSS 2.0 feed. You can leave a response, or trackback from your own site.